This is the fully computer controlled version of the AOD which does away with the T.V. cable and allows the user to custom tune shift points, shift firmness and lock up points from in the cockpit without a laptop or PC thanks to the included COMPUSHIFT transmission controller.This transmission is rated to 425 horsepower and has upgraded valve body,internal electronics, clutch packs, bands and servoes for outstanding performance and durability. Transmission includes Torque Max converter with stall speed up to 2500RPM. Available for both Windsor based and Romeo based engines. Optional 9.5 inch high stall Torque Max converter available in stall speeds ranging from 2800 to 4000 rpm. 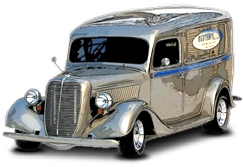 Introduced in 1980, the AOD has been used in nearly every model of Ford vehicle requiring a durable, compact overdrive transmission. The AOD is a good swap choice from the C-4, C-6 of FMX transmissions and shares many common dimensions with these units. Low gear ratio is 2:40 to 1 and overdrive is 0:67 to 1. 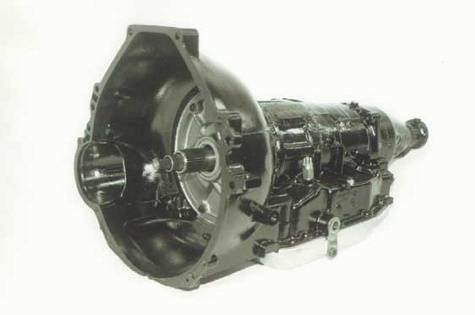 This trans uses the small block bell housing pattern which fits 250 and 300 6cyl., 289, 302, 351 Windsor and 351 Cleveland.